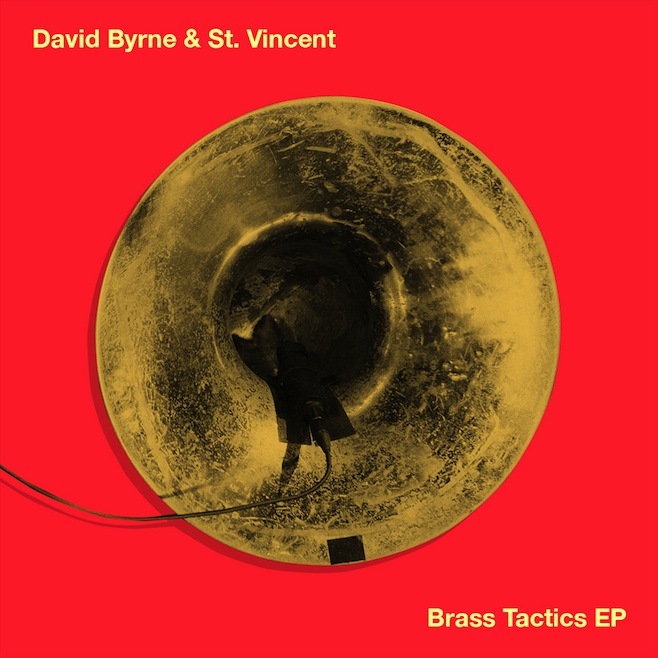 David Byrne and St Vincent Share Some "Brass Tactics"
What's the sound of two brilliant musical oddballs collaborating? For some, it's David Byrne and St. Vincent's 2012 album Love This Giant, which pleased Byrne and Vincent fans alike with some nice, new -- but not too radical -- cooperatively written material. Now, to promote their imminent world tour, the pair is giving an EP called Brass Tactics away for free online to anyone willing to type in their email address. One might even call it a once in a lifetime opportunity. Released as a companion EP to Giant, the download includes one unreleased bonus track, two remixes, two live tracks, and yes, a whole lot of brass. It's classy! The new track, "Cissus," undulates complicatedly in a minor key, recalling Stephen Sondheim's "Sunday in the Park With George." (They made us sing this in chorus class. It was hard.) The first live track is St. Vincent's snazzily disconcerting "Marrow," which harnesses the time-honored pop technique of spelling out words to ask for H-E-L-P with her curious anatomical problems, which are really just a metaphor for an existential crisis. And the final track, of course, is "Road to Nowhere," a classic song whose brand has not been diluted at all by its frequent appearances in the trailers to indie movies. Let's hope whoever is driving their tour bus interprets the concept of "the journey" a bit more literally, though. There's also a cute video trailer for the tour containing numerous black and white candids and pleasant musings like "I know that whenever you follow David on a bicycle it's going to be a fun adventure." Us too, Annie Clark. Us too.